In this blog, you'll learn how to embed Google seller ratings into a website created using one of the most popular website builders. We will cover other website builders in future blogs. Click on the corresponding link to jump straight to the step-by-step guide. You're sure to have seen the orange ratings stars that display under search results in Google (and in other search engines too). It's in this way that you can display your average customer rating on your website, and have it displayed in search engine results. Google seller ratings make your business visible, create trust for potential customers - and grab their attention in the first place. This leads to more clicks on your website, meaning more customers. 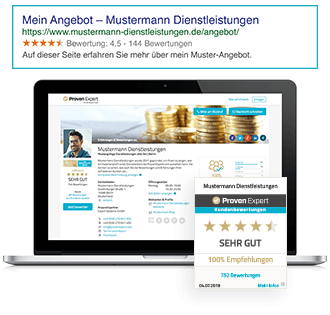 As a ProvenExpert customer, you can profit from Google seller ratings by placing your aggregated customer ratings prominently in the Google search directly on the submenu for your website. It's easy and no programming knowledge is required. Note:In order to display Google stars on the website in the google search results, you require at least the ProvenExpert PLUS plan. How does Google access ratings data? How does Google recognize these ratings and where does the data come from? 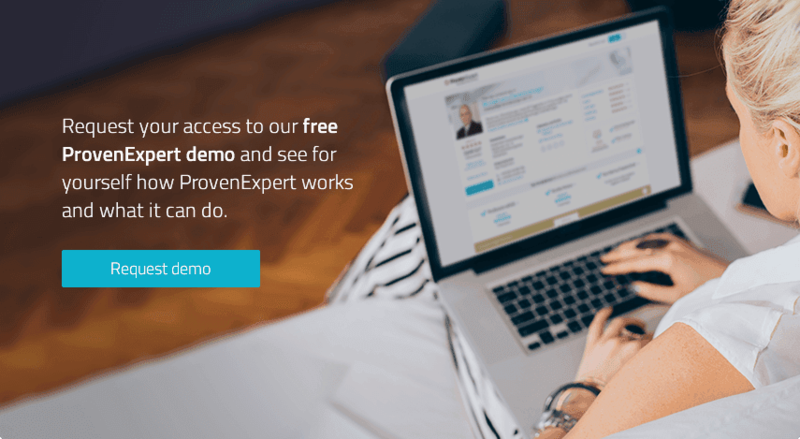 The aggregated ratings and ratings stars from your ProvenExpert profile can be displayed directly on your website. To do this, all you need to do is integrate the provided code into the footer for your website. We'll show you how to do this next. When your ratings stars and reviews are displayed below on your website, Google reads this and will then display them in the form of orange stars in search results. Many people with their own website use website builders, so in this tutorial, we’ll show you how to integrate Google seller ratings into a website created with a standard website builder. In two simple steps, we'll show you where to find the code snippet and provide a detailed guide for adding it to your website. There are some tips and tricks for doing this. For your Google seller rating stars to appear in Google search results, you need to integrate what is known as a rich snippet into your website. This means you need to display your ratings stars on your website in order for Google to recognize them at a later point. Keep reading to learn more about how to find the code you need to display a rich snippet with your seller ratings on your website. A rich snippet enables your data is be analyzed and comes in .org notation. This allows the Google crawler to retrieve your average score, rating stars and number of reviews and display them in your search results listing. You can find out more about the use of rich snippets and recommendations and official guidelines from Google here. Log in to your ProvenExpert profile and click above right on „Google seller ratings“ (or follow this link if you are already signed in). Here, you'll find the code, which you need to copy and paste into your website in order to display Google seller ratings. Before integrating the script, define how you want to display the stars on your website. Select the kind of display you prefer and the code will be automatically adjusted. Note:It’s important to have the rich snippet displayed in full on your website, including with stars and ratings, and it must be visible and not blocked by other content on your website. If this isn’t the case, Google will not be able to read the code and your ratings won’t be visible in search results. To integrate your Google seller ratings into a website created using a website builder, see the tutorial from your provider (e.g. Jimdo). We’ll show you the best way to make your feedback visible to your customers. Note:No matter what kind of website builder you use, integrating rich snippets into the footer is recommended. This is the bottom part of the website. Unless you have specified otherwise, the footer will appear identical on all your website's sub pages. 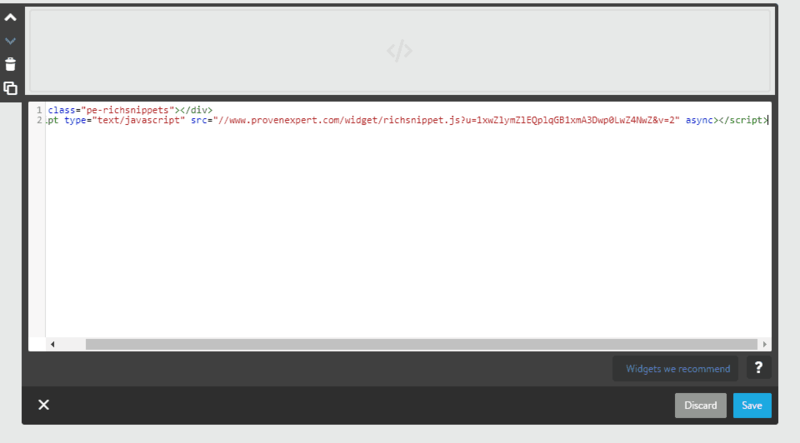 In the example below, you can see the footer for www.provenexpert.com with the rich snippet below on the right. If you've integrated rich snippets into the footer, make sure that the Google seller ratings are displayed for all your sub pages in the search results. Customize your website to your exact preferences. 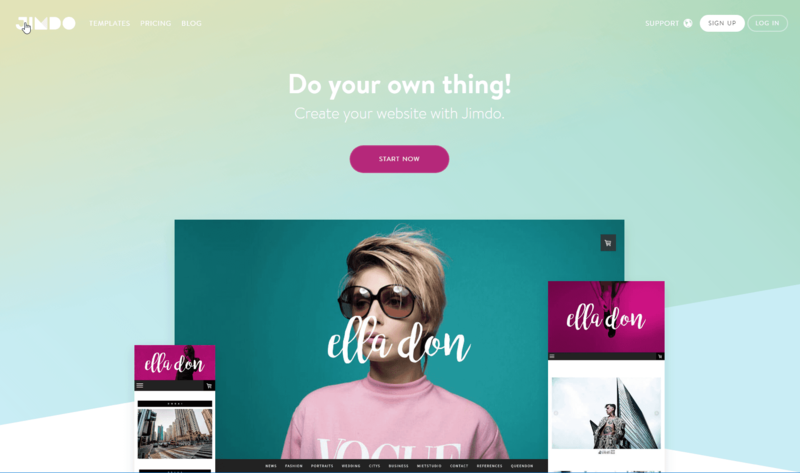 Jimdo contains a range of templates for various website themes and fields of activity. After setting up your website or online store on Jimdo, you can integrate Google seller ratings. To add Google seller ratings to the website footer, scroll down to the bottom of the page add use the function „Add Content“. A new window will open for integrating widgets from other platforms or Google seller ratings. To have your ratings stars displayed in Google search results, click on „ "Additional Content and Add-ons"“ for further options for adding content. Here, click on „Widgets/HTML“ to integrate the code. After you’ve pasted in the code and finished the process by clicking on „Save“ , your Google seller ratings will display on your website in the position you have specified. You’re almost there! Google just needs to recrawl your website first. You can wait until Google does this by default, but we recommend you send Google a notification that your website contains new content and should be recrawled. Your Google seller ratings will be visible on your Jimdo website shortly - there’s no specific duration for how long this will take.